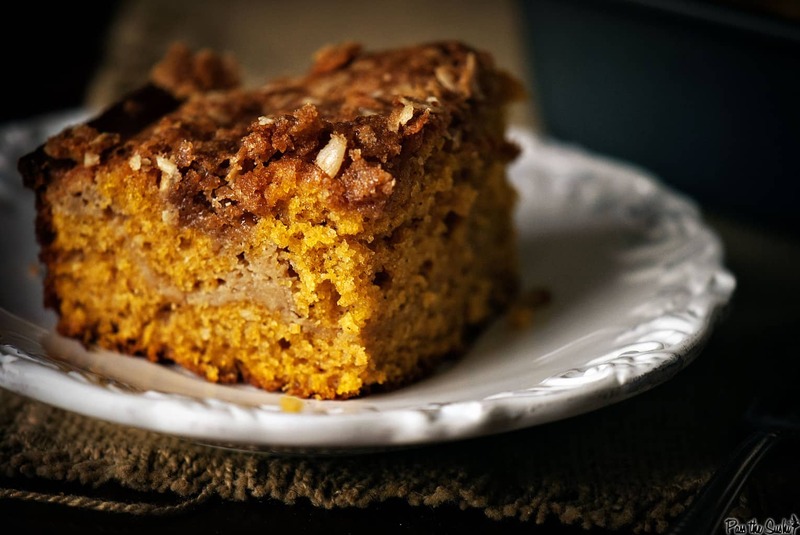 Pumpkin Latte Coffee Cake; soft, crumbly, and oh so good. A layer of cream cheese makes this one of the smoothest coffee cakes out there. Normally, I test out one or two new recipes on friends at big holiday gatherings or social events, always forgetting the danger of that until I set the platters down and have my own private lack of Xanax induced freak out. Instead of prepping and testing some recipes all week for a little upcoming Thanksgiving feast, this year I have been (much like a whiny child) doing my civic duty and serving on jury duty all week, leaving me unable to cook or test any recipes between that and working. Oh no. So, we’re going to wing it and see how things go with an all new menu and never before tested recipes. Push comes to shove, I think there’s a can of tuna somewhere hidden in the back of my pantry. Are you shaping your menu with family favorites or are you adding new things? 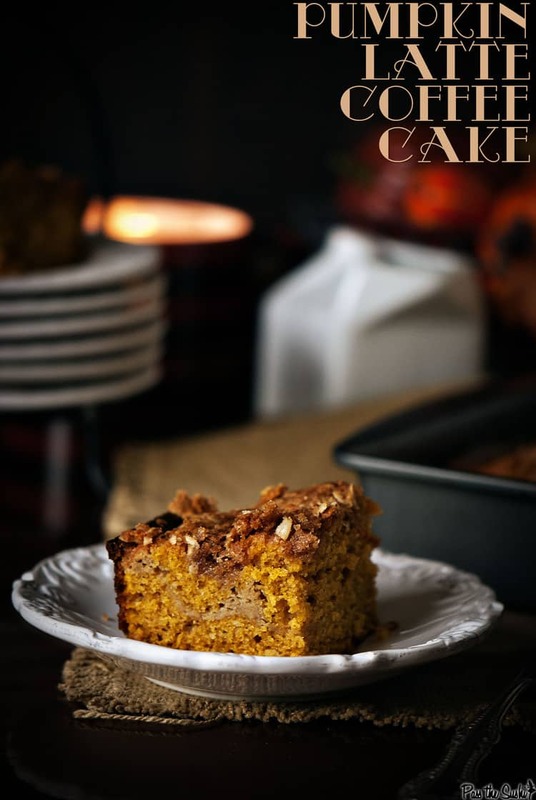 If you’ve tried this Pumpkin Latte Coffee Cake recipe or any other recipe on passthesushi.com please don’t forget to rate the recipe and let me know where you found it in the comments below. I love hearing from you! You can also follow along for more good eats and travel tips on Instagram @passthesushi & @girlcarnivore, Twitter & Facebook. 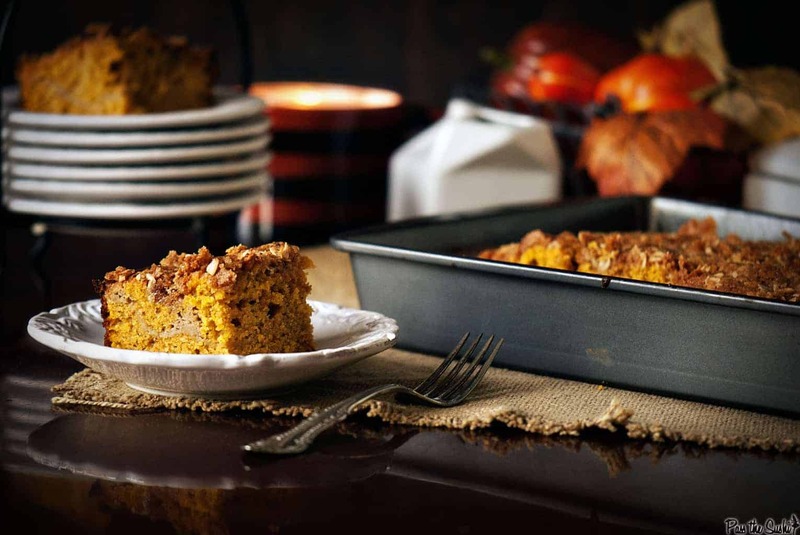 Looking for more pumpkin recipes? Try this Bread Pudding. 2/3 cup canned pumpkin, not pumpkin pie filling! Preheat the oven to 350 degrees F. Grease a 9 x 13 baking dish and set aside. Whisk the eggs and the espresso powder in a bowl until combined. In the bowl of your stand mixer, fitted with the paddle attachment, beat the cream cheese until light and fluffy, about 30 second on medium high. Add the sugar and flour, scrape down the sides, and mix until combined. Scrape down the sides again. Add the egg mix and vanilla and beat for a minute longer until everything is combined. Spoon out into a bowl and set aside. Clean out your mixing bowl and paddle attachment and dry (consider asking Santa for an extra bowl) . Whisk the flour, baking powder, pumpkin pie spice, baking soda and salt in a large bowl. Beat the butter until creamy in the clean bowl of your stand mixer, about 1 minute. Add the sugar and beat until light and fluffy. Scrape down the sides as needed. Add the pumpkin and mix until just combined. Alternating between the flour mix and the buttermilk add the final ingredients in three additions, beating on low and mixing well. Pour half of the batter into the prepared cake pan. Spoon in half of the cream cheese mixture and try as best you can to even it out. Make the streusel topping (this can be made ahead of time and stored in an airtight container in the fridge). In a bowl, combine the brown sugar, rolled ours, flour, pumpkin pie spice, cinnamon, and salt in a bowl. Using your fingers, cut in the butter until the mixture is coarse and crumbly. Bake for 45 to 50 minutes until a toothpick inserted comes out clean. Cool on a wire rack before slicing to serve. I always get nervous about making new dishes for company when I haven’t had a chance to test them so I try to limit that to just a couple of items… but that is so hard when trying to constantly come up with new creations for business and blogging! This cake is straight up fabulous! Yum! I just learned that we’ll be headed to my in-laws so I won’t be able to cook. I’m pretty bummed about that. If I was cooking, I’d do a mix of favorites (my turkey) and mixing things up. Keeps everyone guessing. I’m the fool who almost always tries new recipes out on family/friends – luckily nothing has been completely inedible yet… This cake sounds insanely good and that top photo is beyond gorgeous! You just turned my favorite beverage into a cake…and that’s why I love ya. We are having the same ol’ same ol’ on our menu this year. I have no time to come up with an entirely new menu. I like you, am quite adventurous. I have no problems (outwardly) of testing new recipes on family and friends during the holidays. There’s always plenty of traditional food as back up anyways. This would be a perfect T-day breakfast! Seriously Kita…why aren’t we neighbors! We would fatten each other up in no time! Pre-test recipes on friends and family? Seriously? I’m yet to get into that habit….which would obviously explain why I end up with burnt roasts and exploded cupcakes most of the time so far. But you’ve inspired me really. My dad’s birthday’s coming up and I think I’ll test run the cake. Maybe this cake. Oooh. This cake also reminds me of my breakfast runs when I was working in my last office. I used to always grab a latte and pumpkin coffee cake on the way to work. Thanks for the recipe! This cakes looks so delicious! I love the ingredients…I add cream cheese to some of my cakes as well and love the results…thanks for sharing!